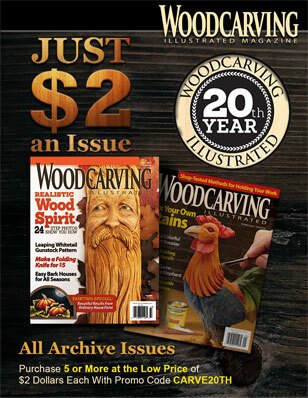 This article was first published in issue 44 of Woodcarving Illustrated. 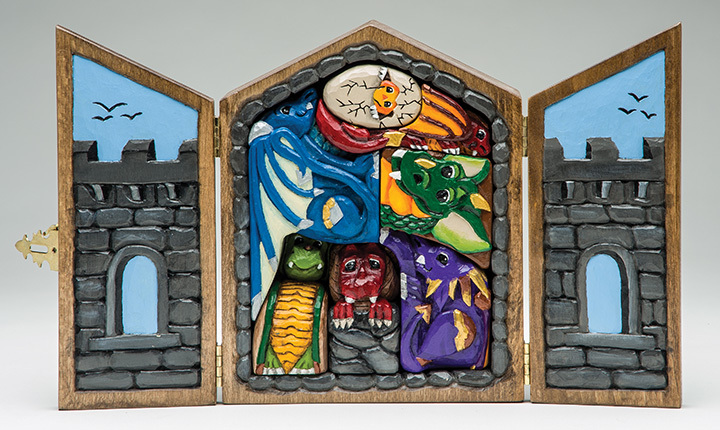 Having a dedicated area set up to paint is as important as having an area set up for carving. 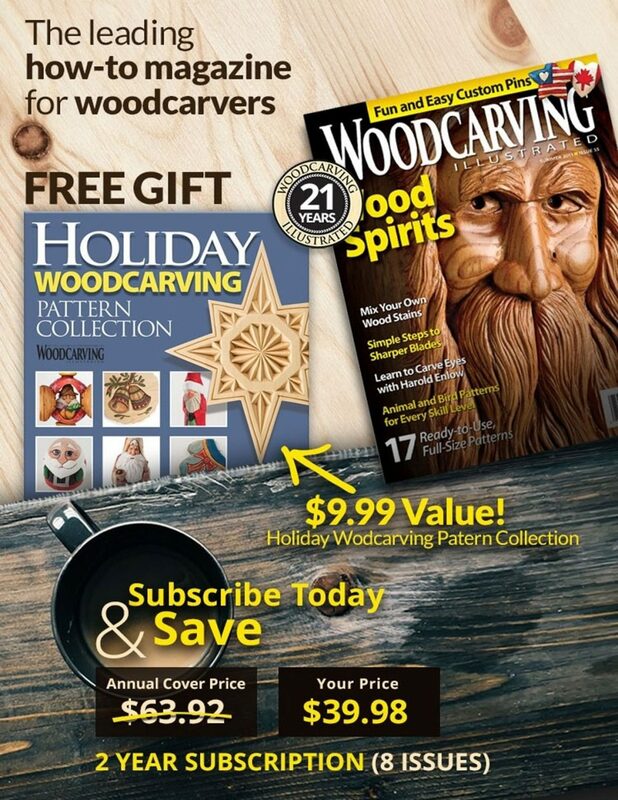 It could be an extension of your carving area, but make sure it is organized, convenient, and comfortable. Keep it simple to eliminate clutter and time lost searching for materials or tools. Specific items were covered in WCI Fall 2007 (Issue 40). This article focuses on how to arrange the items in an orderly fashion to make the most of your space and time. If you plan to paint for long periods, a footstool may keep you from hunching over your work. Make sure the area is well lit at all times. Place a hand towel or place mat over your work area. When soiled, this can be washed or changed. Disposable Palette: Disposable paper palettes are available in pads. 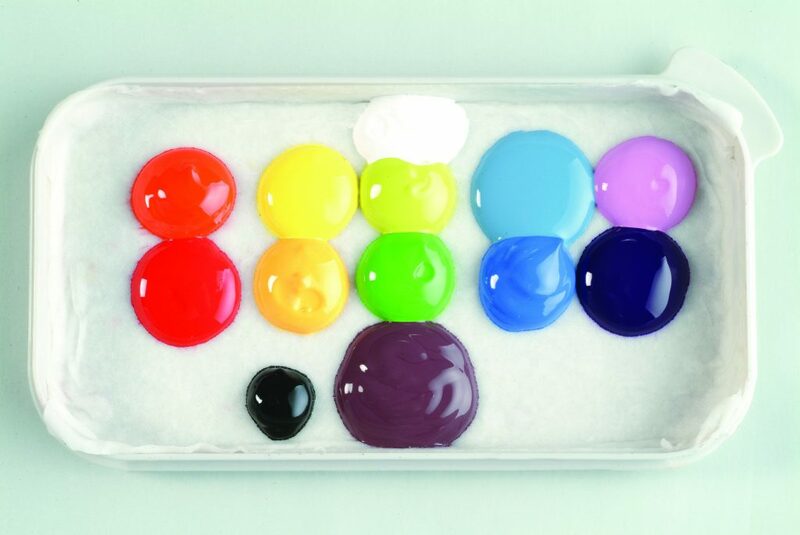 They are used for color mixing and dry palette blending. 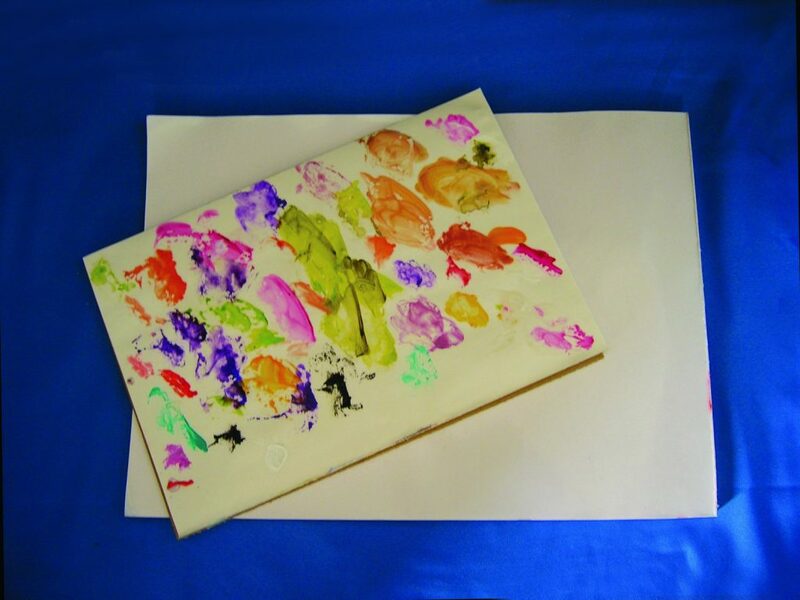 Place a disposable palette to the right of your work area, within easy reach, for color mixing and blending. Buy a 9″ x 12″ pad and cut it in half to save space on your work area. 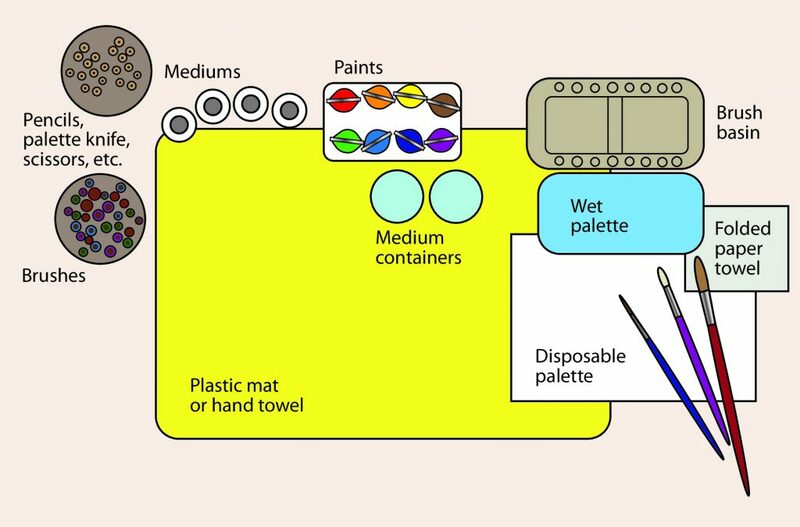 Wet Palette: The wet palette is a shallow container used for paint storage. Position it on top of the dry palette. A wet palette may be as simple as a paper plate or a Styrofoam meat tray. An airtight food storage container keeps paint workable for several days or weeks. Brush Basin: A divided brush basin makes it easy to clean your brushes. Position it above your palettes. Most basins have two sections: one to clean the brushes in and the other to pick up clean water to dilute the paint as you work. Dirty water will change the color of your paint so keep the water in this side of the basin clean. Fill the basin no more than 2/3 full of water on either side. Blotting Paper: Fold a good quality paper towel in quarters and place it under your wet palette or along the side of your disposable palette. This will be used to remove excess paint, medium, or water from the brush while painting. Refold as needed to keep a clean spot to wipe your brush. Paint: Select the colors needed for your project and arrange them directly in front of your work area. Many people find it helpful to store the paints in a shallow container that can be moved. Place them so the colors can easily be seen. I sort them into color families. 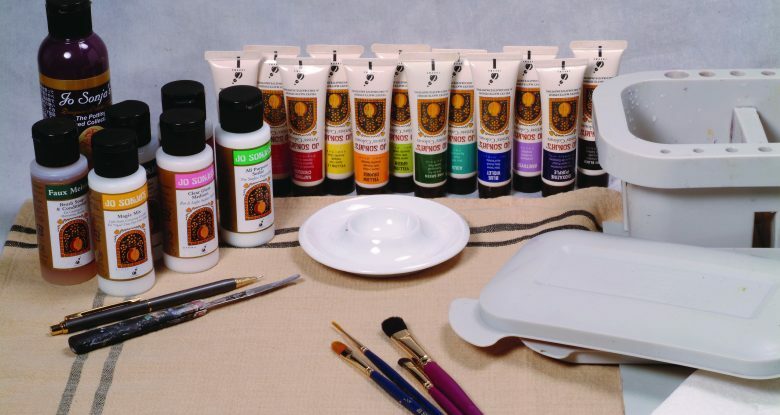 Mediums: Keep a small container for each of the mediums you use regularly while painting. A container for your mediums may be a lid from a jar, or a small prep bowl or egg holder from the kitchen. Brushes: Brushes may be stored bristles up in a drinking glass, bottle, or wide-neck vase. After cleaning, allow the brushes to dry on their sides before returning them to their container. Store pencils, palette knife, scissors, and other miscellaneous supplies in a separate container to the left of the work area. This simple method of organizing your painting supplies allows you an open work area to focus on your project, with your supplies neatly arranged for easy access. Each artist will have their own preferences, but the layout suggested is a good place to start. Feel free to tweak the set up to best suit your individual needs. Vicki Rhodes is the author of numerous articles and three books.